Make your wine divine, first time! Perfect for dinner parties, drinks with friends or just unwinding after a long day, the WineWand from EMEN Drinks is the world's first in-bottle wine chiller. Made from brushed steel with a pour-through aerator so there is no need to remove it when pouring, it can be frozen beforehand and will keep wine cold for up to an hour. 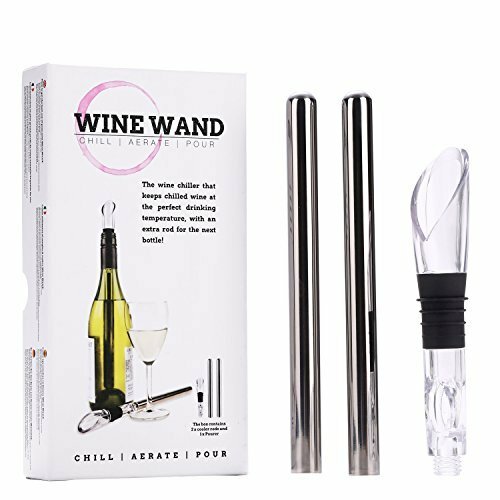 Unlike other inferior products WineWand comes with 2 wands meaning no matter who comes round for a drink or how thirsty you get, chilling the next bottle is covered! This product is the perfect wine accessory for the wine fan, and helps you enjoy your bottles of wine at their optimum. Wine Accessories get no better than this. WINE COOLER - this is the perfect wine accessory for the wine aficionado, should you wish to maintain the chilled temperature of your wine. Additionally in each box we supply 2 WANDS, ensuring you always have one good to go for the next bottle! Delivers your wine at the perfect temperature to the waiting wine glasses! WINE AERATOR - pouring your wine through our aerator allows your wine to breathe and oxidise, creating a better bouquet, improved flavours and mouth feel, along with a smoother finish. Once you put your electric wine opener away, just insert the Wine Wand. WINE GIFT - EMEN Drinks is a drinks accessory brand, with exceptional experience in the wine and drinks trade. WINE CHILLER - forgot to chill that wine you really wanted to drink? Dont worry, if you have your wand in the freezer, simply pop one in to your bottle of wine, and within minutes it will start to chill, and hold that temperature for longer. Stop looking for Wine Gifts this is as good as it gets! Wine pours beautifully from our mighty Wand, it also acts as a " wine ice stick ", wine fridge / fridges aren't required! If you have any questions about this product by Wine Wand, contact us by completing and submitting the form below. If you are looking for a specif part number, please include it with your message.